North Atlantic Books, 9781623171438, 160pp. Yoga offers vital tools for healthy aging: strength, flexibility, balance, and peace of mind. 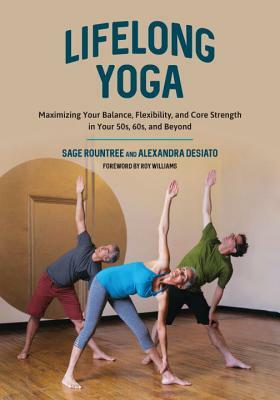 In this one-of-a-kind book, Sage Rountree and Alexandra DeSiato describe the poses and routines that can help keep people of any age fit and injury free. In addition to demonstrating simple ways to maintain and even increase our ability to be active into our 50s, 60s, and beyond, the authors—both yoga teachers with decades of experience—offer poses and routines aimed toward specific goals, such as improving balance, maintaining strength and flexibility, and recovering properly between workouts. Each fully illustrated sequence is introduced with a brief overview of its benefits, along with modifications and options suited to individual requirements. Rountree and DeSiato also offer sequences that help support specific activities such as running, swimming, or golf, as well as yard work, travel, and caring for grandchildren. An essential and easy-to-follow guide, Lifelong Yoga offers key practices for maintaining and improving physical and mental well-being throughout a lifetime. Runner's World. Her website is sagerountree.com. ALEXANDRA DESIATO is a seasoned teacher of yoga and an expert Pilates instructor who has taught several athletic teams at the University of North Carolina, including the football team, men's basketball team, and women's rowing team. She is a regular contributor to YOGANONYMOUS and Wanderlust. Her website is alexandradesiato.com.